Having your own dacha is amazingThe opportunity to relax and gain strength after hard working days. And if you plant a few fruit trees, you can enjoy your homemade jam all winter. But if you firmly decided to make a holiday space out of your summer cottage, you need to think about how to make several hundred acres of land cozy. That is why today we suggest that you consider several options for decorating your dacha. Buy or do it yourself? Of course, you can decorate the territory with help,Bought things in the store. After all, we all saw a huge number of toys for the lawn, interesting lanterns and other small things that can make any home cozy. But in my opinion, it will be much better if you make several ornaments yourself. So you can attract even the smallest members of the family to work, which will positively affect their upbringing. 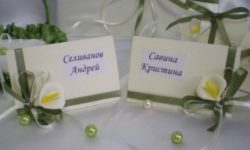 Dacha hand-made articles are not onlyWay to decorate your private space in a special way, but also the opportunity to spend more time with your family. In addition, you can divide the site into zones. 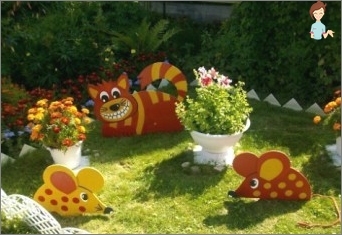 For example, make a corner for children with a variety of fairy-tale figures. But near the brazier you can put a few beautiful self-made benches. 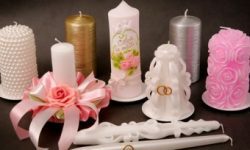 In general, crafts for the dacha will help you make your country house a place where you really want to come and just relax. If you built a dacha from log cabins, and after finishingConstruction you have a little material left, then do not rush to get rid of it. All kinds of stumps, small wooden inserts and other remains can be used to decorate the territory. A bunny for a dog. And also with the help of different small wooden elements you can decorate the gates, the facade of the house or the green lawn. The main thing, include imagination! 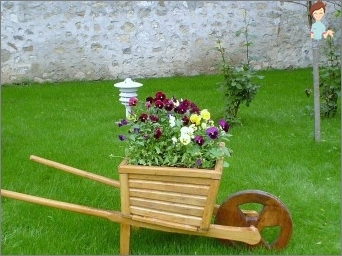 The first thing that we will learn to make of wood -It is a flower bed. If you have a large piece of log left, you must cut a large hole inside it. If you want the flowerbed to be deep, you can make a hole through. But if the role of this flower bed is exclusively decorative, and the plants do not need to be watered, then only a part of the tree can be cut. Then, place the flower bed on the territory, pour a bit of land into the hole and plant flowers there. If you have the time and desire to grow them yourself, you can buy seeds on the market. But if you just want to create coziness and moreNothing, then the best option is to buy already grown seedlings. In general, do as you please, the main thing is that the process of decorating brings you pleasure. From the remains of logs can even make childrenToys. Remember how often your children break the plastic cars bought in the supermarket or the swings. But if you put a few locomotives at the dacha, the children will rest there with great pleasure. The advantage of this element of decor is practical: if you screw to a similar locomotive of a wheel, it will not only beautify the territory, but also give your children a lot of pleasant minutes. To make such magnificence is very simple: You just need to cut out the seats in the small log and attach the wheels. And if you have somewhere in the garage, the wheel from the bike is covered, then your train will have a wonderful steering wheel. But, for example, if you have a few oldTires, then you can make an absolutely stunning swing. There can be several options. 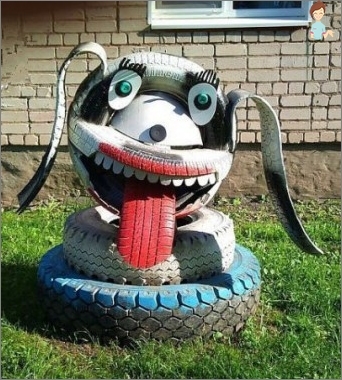 Let's start with the simplest: Take one tire and cut it in half. So, you have two rockers. We attach the board to the top. You can fix it with nails. If you have small children, it is worthAttach and handle. To make them you will need a rope. Drill in the board two holes on each side and thread a rope through them. Attention! Make sure everything is symmetrical. Otherwise, the swing will constantly roll in one direction. If you want to somehow decorate these swings, you can sew the upper part with a cloth. And it can be used as a shop. Also from car rubber you can make an ottoman. For this you need a tire, a round board, a thick string. Sprinkle the tire on the floor and attach to it from above with a drill board. Then starting from the middle of the board, we begin to gently wind the string around the tire. The main thing is to not see the rubber. When, finish winding the string, be sure to cover it with special glue or wood varnish. So your ottoman does not go to pieces. So an interesting interior object is ready. Decorate the cottage with a stone is very simple, you can startWith the usual mural. For example, if you find the right pebbles, then very adorable beetles can settle under your tree. All you need to do is apply a little paint to the surface of the stones. Draw your eye beetles, antennae and wings - and a fairly simple decoration will be ready. And if you want to make a creative path, thenHere you will need stones. However, in this case it is best to collect small pieces of pebbles. When you have collected a sufficient amount of material, form round concrete tiles from concrete and until it has completely solidified, press in it small pebbles. 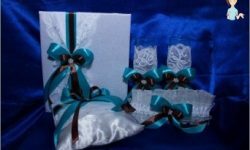 By the way, the undoubted advantage of this decoration is that you choose the pattern yourself. So in the end you will have a unique track! Small stones can also be used forFountain decoration. If you want, you can put several stones in the water, and then the water will flow unevenly, forming small water rapids. So you not only give your home a cosiness, but also you can meditate a little near your individual fountain. Dacha articles made of plywood - this is generally expanseFor fantasy! Here you can create some decor elements, cut animal figures, flowers or people. The main thing is the desire to create something out of the ordinary and a little time. How to do this we show you on one particularExample. On the right, in the figure is a stencil for cutting a butterfly. In order to transfer the pattern to a piece of plywood, you need to circle the contour with a pencil. Then, using a jig saw, cut out the figure. If you decide that your butterfly will have patterns on the wings, you can immediately apply them with a pencil. Then, gently working with a jig saw, cut thesePatterns. Now you need to decide on the color. The perfect solution will be bright colors. So you can give your dacha site originality. All parts should be fastened with a drill and placed in the garden. Want to teach the child to help animals. Make a bird feeder with him. All you need is two small pieces of plywood and several dense ropes. From the plywood you get the roof and the bottom of the trough, but the rope can be used as a connecting material. Attention! Carefully process the edges of the feeder so that your young guests can not get injured. As you can see, doing your own handmade crafts to giveCan and is not easy, but very interesting. And most importantly, you invest in each piece of your soul. And any place, decorated with a soul, will be very cozy!